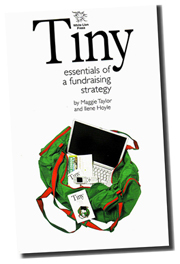 This little book tells you all you need to know about introducing, planning and implementing a strategy that’s right for you and your organisation. What’s more, it’ll give you all this valuable insight and information in just about an hour, as that’s all the time it will take you to read and digest this latest addition to the indispensable TINY ESSENTIALS series. Of course it’s hard to consider strategy without conjuring military connotations, perhaps because the term derives from the Greek word for army. Strategy differs from tactics in that tactics is concerned with the conduct of a specific engagement while strategy is concerned with how different engagements are linked. In other words, how a battle is fought is a matter of tactics: whether it should be fought at all is a matter of strategy. Maggie Taylor and Ilene Hoyle show us here how, with a little foresight and application matched with some careful planning and judicious engagement of all the players, it is possible to devise and implement an effective strategy for our organisation without getting too hot and bothered about it in the process. You can now search inside this book, here.